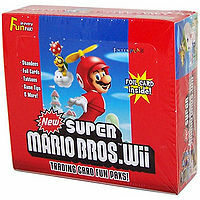 The New Super Mario Bros. Wii trading cards were released in October 2010 by EnterPLAY, the same company that produced the Super Mario Galaxy trading cards and Mario Kart Wii trading cards. Each booster pack contains four regular cards and one each of Tips & Tricks, Standee, Foil and FunTats. A gold foil has a one-in-eighteen chance of appearing in any given pack. The cards were not released in Japan. *Note: Trivia 1 is incorrect. Mario doesn't always get a Fire Flower; the power up he gets depends on the level. Card 24, Sledge Bro is referred to "Sumo Bro." Also, on the back of the card, it accidentally puts an image of Hammer Bro. Foil cards 1-22, 34-38 are essentially the same cards as their non-foil counterparts. F38 (Magikoopa) is available only in a special collector's box. Also included in the box are four booster packs, as well as a New Super Mario Bros. Wii poster, the back of which has a listing of every card. EnterPLAY's website erroneously lists card 44 (Yoshi's Eggs) as an enemy. This page was last edited on April 18, 2019, at 19:34.